Mexican Chopped Salad with Honey-Lime Dressing is one of our favorite salads and I serve it often, especially when we have company. This Mexican Chopped Salad is full of all things healthy and good for you, and the honey-lime dressing is sweet, spicy and simply amazing! I usually make a big batch of the yummy dressing and put it on literally everything. I have even added it to chicken salad and, let me tell you, it was divine! 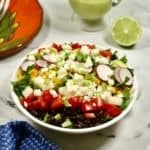 Mexican Chopped Salad with Honey-Lime Dressing is great as a side dish, but it’s also perfect as a main dish vegetarian salad and Mexican Chopped Salad with Honey-Lime Dressing would be perfect for Cinco de Mayo! I first tasted this delicious and healthy salad last Cinco de Mayo when our neighbor Peggy brought it over to a Mexican themed potluck dinner. I have been making it ever since then. Peggy graciously shared her recipe with me, and now I’m thrilled to be able to share it with you! If you like this recipe, you also might be interested in these recipes: Taco Salad with Avocado Lime Dressing, Garden Pasta Salad, and Corn Tomato and Avocado Salad. 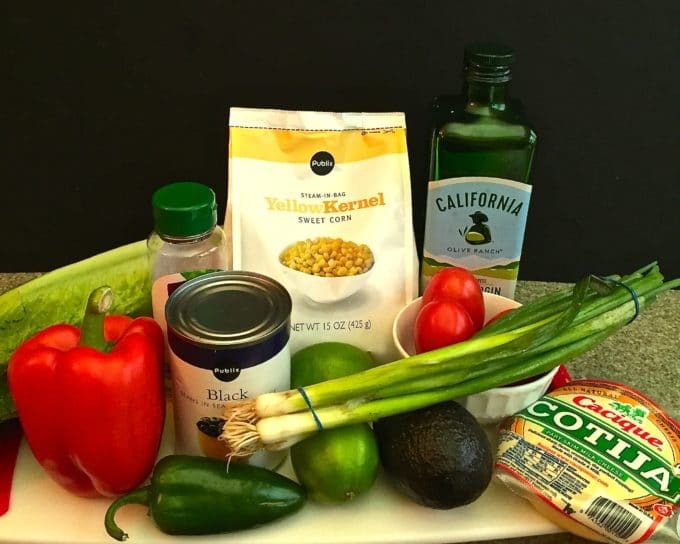 The ingredients for the salad include romaine lettuce, black beans, tomatoes, jicama, frozen corn, radishes, avocado, red bell pepper, Cotija cheese, and scallions. For the Honey-Lime dressing, you will need limes, olive oil, honey or agave nectar, garlic, jalapenos and Kosher salt. 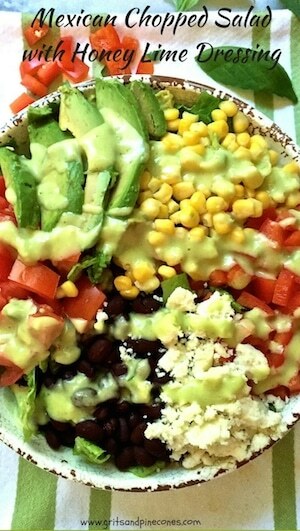 If you are ready to make this delicious Mexican Chopped Salad with Honey-Lime Dressing, start by making the dressing. Add all dressing ingredients to a blender and process until smooth. Store in the refrigerator, preferably for 24 hours before using. 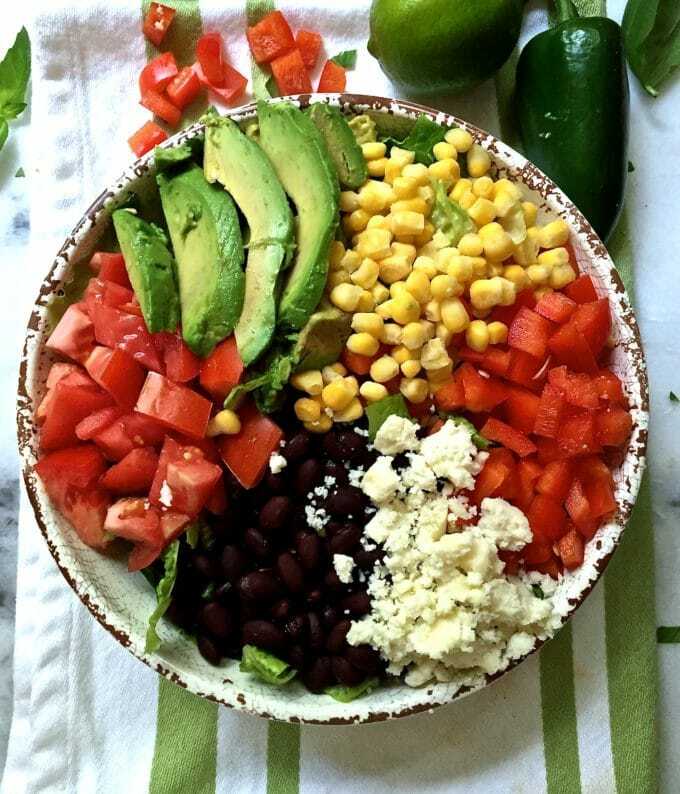 For the salad, toss all ingredients but the avocado and Cotija cheese in a large bowl. Pour the dressing over the mixture and toss again. Top with the Cotija cheese and avocado. Serve immediately. Enjoy! Notes: The last time I made this salad, I didn’t have the jicama or radishes, but it was still delicious. It’s very versatile. Add more or less of ingredients you like or don’t like. If you have never had jicama, give it a try. Jicamas are sort of like a cross between an apple and a potato, and add a crunchy element to the salad. Also, try adding 1/2 of your avocado to the blender when mixing your dressing, it gives it a nice creaminess. If you are feeding a crowd, simply double the recipe! Mexican Chopped Salad with Honey-Lime Dressing is full of all things healthy and good for you and the honey-lime dressing is sweet, spicy and simply amazing! For the Honey-Lime Dressing, add all ingredients to a blender and process until smooth. Store in the refrigerator, preferably for 24 hours before using. 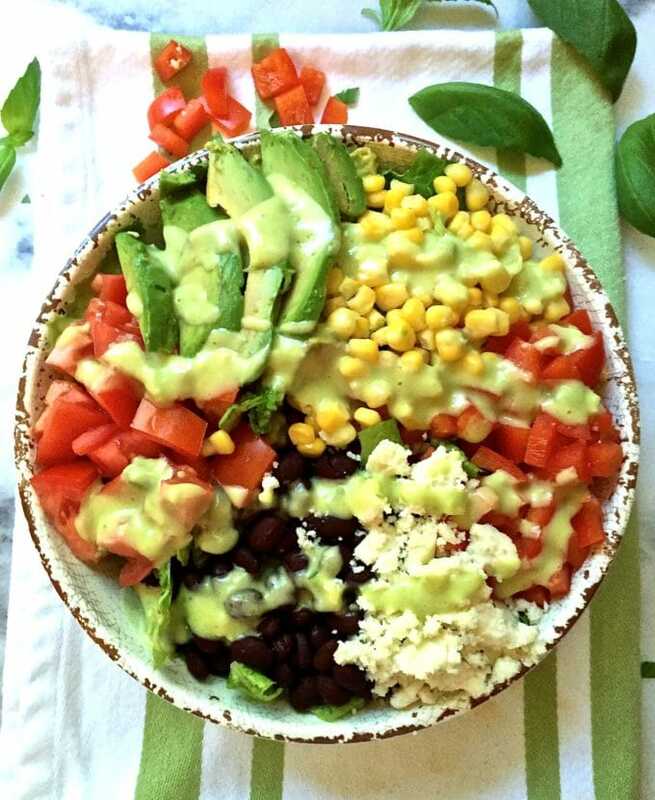 For the salad, toss all ingredients but the avocado and Cotija cheese in a large bowl. Pour the dressing over the mixture and toss again. Top with the Cotija cheese and avocado. Serve immediately. Enjoy! The last time I made this salad, I didn't have the jicama or radishes, but it was still delicious. It's very versatile. Add more or less of ingredients you like or don't like. If you have never had jicama, give it a try. Jicamas are sort of like a cross between an apple and a potato, and add a crunchy fresh element to the salad. Also, try adding 1/2 of your avocado to the blender when mixing your dressing, it gives it a nice creaminess. If you are feeding a crowd, simply double the recipe! If you can't find Cotija cheese, you can substitute crumbled Feta cheese. It has a similar texture and saltiness. Thanks so much for your kind comment! I’m so glad your family enjoys it!